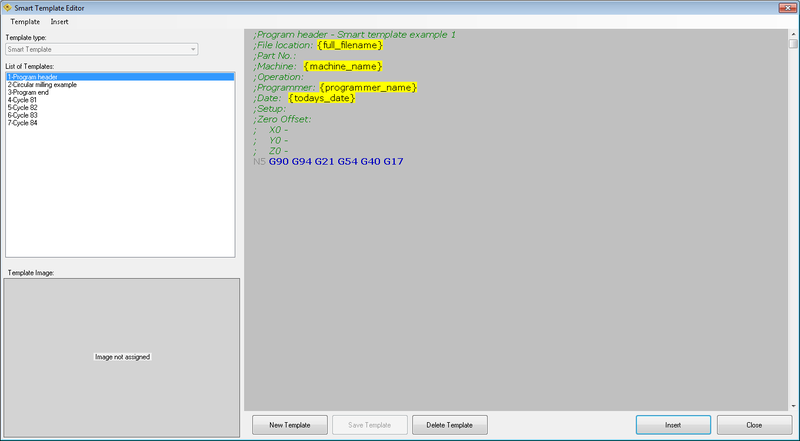 In this dialog you can edit and create Smart templates, line templates and tool change templates. Click "New template" to create new code template, enter your code and click "Save template". Click "Insert" to insert code from a template in a CNC code. When inserting smart template code and parameter is not defined, you are prompted for that parameter and defined values are prepared for an insertion. In a template code you can also use predefined parameters (menu "Insert/Predefined parameters"). For a smart template, predefined parameters are: programmer's name, programmer's initials, machine name, full path to filename, short filename, file location path and today's date. For a line template, predefined parameters are: X value, Y value, mirror X value, mirror Y value, polar distance value, polar angle value and point number. For a tool change template, predefined parameters are: tool number, tool name, tool remark, spindle speed value and feedrate value. Right click on a template image to assign or delete image for a selected template. See also predefined template examples.